Wow, this book is pretty long. Wow, that book was pretty long. THE 5TH WAVE starts out well, if a little slowly. 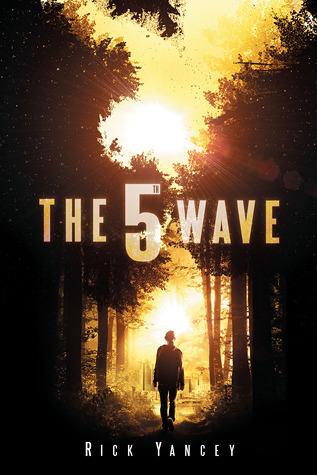 There’s so much to be said about the ideas, the characters, the way that the story is told–but I don’t believe that THE 5TH WAVE is mainstream. When this book is made into a movie, I think this could be incredibly popular. Until then, it will remain adored/completely-not-adored by book lovers and the occasional curious reader everywhere books are held. That’s not to say that THE 5TH WAVE isn’t good. It’s actually spectacularly written, and after you get into it, it’s a rollercoaster of a ride. Yancey writes in such a way that I can’t help but care about each and every single one of the characters, even the villains. He brings up strong points and evidence to support his dystopian world and moves the plot in a way that is realistic and well thought through. There were great twists and turns in this story, and overall I felt like it was really well done. The aliens actually act like humans, the way they’re portrayed in the blurb, and the humans actually feel danger and use their heads. The characters have priorities, and THE 5TH WAVE is extremely well-rounded. It ended in a way that left me wanting the next book RIGHT THERE, but alas–it has to get to the library. My major complaint about this story, and another thing I think will be fixed in the making of the movie, is that the POV shifts. I believe that there are major players in this book whose perspectives needed to be told for the book to be written the way it is, but there are some perspectives where I’m not exactly sure why Yancey would switch it. I didn’t even realize what was happening until about two or three shifts into the POV. All in all, if they do it correctly (PLEASE let them do it correctly), I think that THE 5th WAVE movie will be a lot of fun to watch–but the book definitely will not be for everyone. I would recommend it for people who are okay with slow pacing but a great story and plot. Maggie Stiefvater: Water Horses, Faerie Assassins, Werewolves (Of a Sort) and Raven Boys.